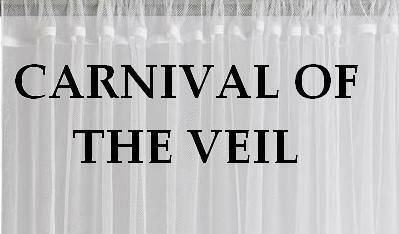 Welcome To Week 6, Of The Carnival Of The Veil!! I first want to say that it is an honor to host this weeks "CARNIVAL OF THE VEIL" and I hope to do it again whenever needed. Thanks Gunner for starting this and I hope that it continues to grow and help a lot of people in the process, for a very long time. Also, welcome everyone to Mormon Truth and if you haven't been here before, I hope that you will find some interesting posts to read or something that will be helpful to you. I started this blog at the end of last July and I have over 150 posts listed on many different subjects. To start things off on this weeks carnival; I published part 3 of my interview with Joy, an ex-Mormon, this past week, which was podcast number 20. It stirred and riled up some folks, especially Jared, the Mormon Apologist with whom I did a 4 part interview, which also included Eric Hoffman, who is a mainstream Christian activist, and who has the Living Truth Podcast site. So, what was it that got Jared and others, all fired up? Well, Joy tells the story of her Dad and how he is now a living, modern day, active, Mormon polygamist,( according to the Mormon Church and with approval from the Mormon Hierarchy) legally married or sealed in their "holy temple", to 2 living women, at the same time. I provide some great quotes, right out of the Bishop's handbook, that prove her story to be correct and to be right in line with Mormon teachings and regulations. Jared will argue that if they aren't together, or in love, it's now invalid, and doesn't even matter, which is complete BS, because the Church puts anyone through hell, that is seeking a temple divorce or cancellation of their sealing, no matter how many years it has been. They want details and they try to dig up all the reasons the marriage failed, if there was sin involved, etc. It is disgusting!! You can read more about this on my Mormon Truth Podcast blog and even listen to the podcast if you are interested. The more listeners, the merrier and spread this word. I have no bandwidth issues, so download away and encourage as many people as possible to download my podcasts. One other real quick note that I'm excited to announce, is that in addition to my regular Mormon Truth Podcast, I have added a new podcast, which I will call "Mormon Truth Uncensored." It will not have any music, editing or frills, just me, talking about whatever is going on or on my mind, that very moment and will just be off the cuff. I hope that you will all enjoy it!! It will give me a new found freedom and the ability to instantly respond, from anywhere that I am, in town or out of town, which is something that I haven't had with my normal podcast. So, thanks everyone for your support and I hope that you enjoy this weeks "Carnival Of The Veil!!" Over on the "Beyond Ourselves blog", there is a pretty interesting debate going on. With all of the controversy over the Mormon Church opposition to the gay lifestyle and gay marriage, which included Russel M. Nelson going to DC and publicly speaking out about it, Hellmut wrote a great piece on "scapegoating gays", which is getting a lot of responses. Also, this is certainly appropriate for discussion, especially after having heard last night, that the BYU professor, that wrote a great opinion piece in the Salt Lake Tribune a week or so ago, pleading for equality for homosexuals in the Church, has now been officially fired from BYU, for "disagreeing with the First Presidency." I see little if any scapegoating of gays, in the sense you and I understand the word scapegoating, among Church members or in the leadership of the Church.Church leaders at all levels have long expressed disapproval of homosexual acts, but the disapproval is of those acts intrinsically. Or, in other words, to borrow your terminology, those engaging in homosexual acts reap the disapproval of the Church and its leaders "for deeds that are . . . their own (emphasis added)." Hellmut is claiming that the LDS Church is scapegoating gays and Daniel Peterson, of course, disagrees. What a surprise eh? To read more about this, and the post in full along with the 69 comments, or to leave a comment of your own and join the debate, please head on over to the "Beyond Ourselves blog." Over on the "Heart of Darqueness blog", Darque wrote about "Do what is right, let the consequence follow." This is one of the cornerstones of mormonism; do the right thing regardless of circumstances. Put your faith in the lard, take that step into the dark and find that there is light.Your family is dirt poor? Pay tithing and watch as the windows of heaven open and a myriad of blessings are poured out upon you. Sell everything you have and make that 10 day bus journey to the temple, your life will be blessed.Etc etc etc. You know the drill. To read this entire post, which is excellent, head on over to the "Heart Of Darqueness" and check it out and leave a comment. the final line of this post is what the Mormon Church is truly all about and I agree with Darque wholeheartedly. Over at "Eighthourlunch", Doug Humphries heads on up to the Celestial Kingdom, to interview Elijah Daniels, who waited to be with his wife again, for 57 years, only to find out that she had annulled their temple marriage and married some other dude, who was a Mormon General authority after Elijah had died. I think you guys will enjoy this. Then he talks about something that was the topic of my last podcast with Joy, which is the Church's policy to allow men to be sealed to multiple living women(AKA Polygamy), while women can only be sealed to one man period. This is simply outrageous, as I have also pointed out and it proves that the Mormon Church does indeed believe strongly in modern day polygamy and in fact, they still practice it in their "holy temples", as we speak, with direct approval of the Mormon Prophet and The First Presidency. To read this post, and join in the conversation, head on over to "Eighthourlunch" and check it out. This week, over on "Mormon2Catholic", the discussion was about the "Mormon Godhead" VS the "Christian/Catholic Trinity." "I did a three part series of the Christian/Catholic concept of Trinity vs the Mormon concept of 'Godhead'. The Mormon point of view was taken from a speech given by Bruce McConkie to the students of BYU in I believe 1982." I'm sure that Cynthia would love your comments and insights into her analysis and thoughts. There is quite a difference in the Mormon view of the trinity/Godhead VS. the standard Christian/Catholic concept and I'm sure that you will all find this to be educational and interesting. Diane Lowe, from the "thought spot blog", wrote a great post about "religious blessings." Diane's Uncle had to go the ER and have surgery the other night. She describes her experience watching her Uncle's Stake President and Bishop, give him a blessing with consecrated oil. Diane is Catholic and so she shares her point of view from a Catholic standpoint. I, obviously, would have been more comfortable with a priest, but then again, I'm Catholic, not LDS. I don't want to be rude, or sound unappreciative, but the prayer was something slightly more elaborate than "Lord, help this man have a good night's sleep and watch over him in his operation tomorrow." It didn't comfort me at all, and I'm not exactly sure it comforted the other family members in the room. As for my uncle, he didn't tell me if the blessing comforted him or not. I walked away from the experience thoroughly unsatisfied. You can head on over to "thought spot", in order to read her entire post and leave a comment. It was great for me to read Diane's point of view, from a Catholic standpoint, in order to see how other people from different religions, view the Mormon's "blessings for the sick and the afflicted", including the anointing. On the "Not a Mormon Blog", Matt writes a great post entitled, "Didn't Mormonism used to be a church?" He discusses how the Mormon Church has radically changed, just from the 1960's, when his family joined, until today. I believe that it is possible that the history of the Mormon church is something like this:- Joseph Smith started the Mormon church as a combined joke and method of scamming money from people. After all, making your faithful followers take baths and then getting them to wear underwear with magic markings sewn on to them has to be a joke, right? Matt points out that it used to be a Church and no longer is and I give Matt a big Amen on that statement!! To read this entire post, just head on over to "Not a Mormon" and enjoy. Finally, over on the "Viva Ned Flanders blog", Ned writes a post entitled, "Nice people don't make Mormonism true, but they don't hurt either." He describes a visit that he had the other night from 2 people from his local ward, after they had tracked him down, after 10 months of living there. For perhaps the first time in my life, I felt comfortable around my would-be reactivators. I think it was because I knew that the possibility of me regaining my belief is zero. But that doesn't mean that I can't be social with people who still do believe. There is no reason people with a lot in common can't be friends without any religious overtones. The only time they even broached religion was to ask me if I wanted home teachers or if I wanted to be informed of ward activities (I swiftly nixed both ideas). I told them that I was completely uninterested in anything religious. Some great points are made in this post, as he points out that there are nice people in the Mormon Church and that he no longer fears them, due to the security he feels in his non-belief. In order to read this entire post, check out "Viva Ned Flanders" and feel free to leave a comment. Not all views need to be negative and his rang true. Well everyone, that is this weeks "CARNIVAL OF THE VEIL" and I hope that everybody enjoyed it. Feel free to leave comments and we can all look forward to next weeks CARNIVAL. Thanks again Gunner for creating this and thanks to everybody who has contributed each and every week so far, as well as those that have volunteered to host it.